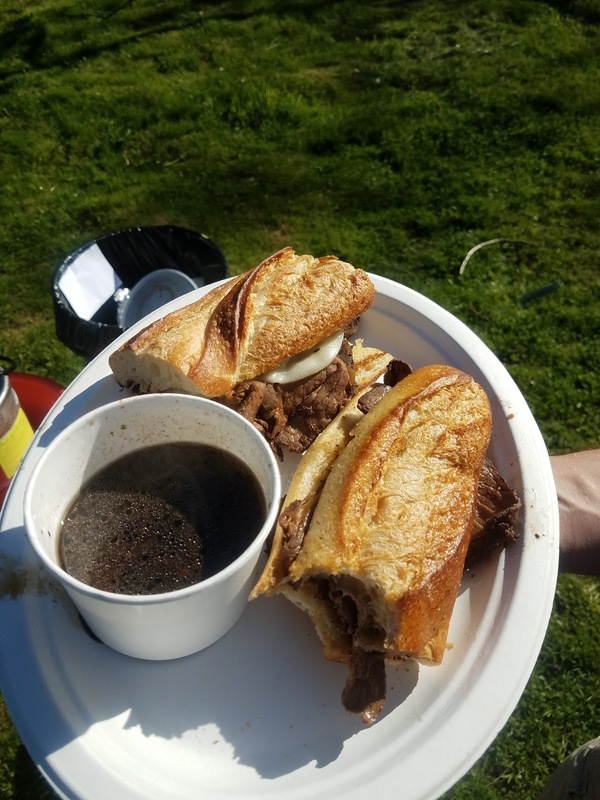 This is perhaps the French dip review that I have been waiting to write from the beginning. I started this blog when Jessica's friend Brianne B. suggested I should be a "French Dip Critic". I loved the idea and thought it was funny (and crazy) so I pursued it. It's been a really fun project that has thought me a lot more about the internet, publishing and business. The time had come for me to make my own French dip sandwiches after reviewing over 80 myself. I had done my research and due diligence and the time had come. It was my 40th birthday party. My mom, who is a prolific cook and host, tried to talk me out of the project as well. I was having none of it. I would do it. So I started to make my list of items I would need: butter, cheeses, onions, garlic, cups and the requisite items. 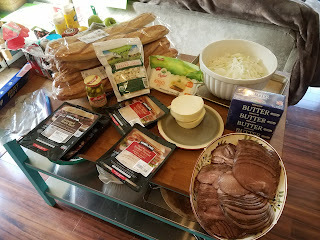 I was able to shop for most of the stuff at Costco and got a grip of stuff. It was fun, and expensive. I found a local restaurant-supply store for the jus cups; they were the hardest thing to find. 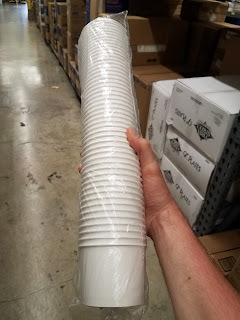 Jus cups from Cash & Carry in Bellevue, WA. Here are the cut onions for caramelizing. Eyes burning and food processor fully utilized. Those are very large bowls, by the way. There would be onions. If we look at the table, we also see roast beef, turkey, provolone and havarti (people need choices) and a lot of French baguettes. Another view of the supplies. We see a large, Costco-size thing of peeled garlic, a ton of roast beef and some havarti, unpackaged. Cutting the little hard nub off of all that garlic took at least 30 minutes. It was a hell of a project and there were a lot of other things to do that day in preparation for our guests. I was kind of stressing but loving it. I also managed to mow the lawn and weed eat (we live on five acres so this is not a small feat) that day. And a lot of butter. 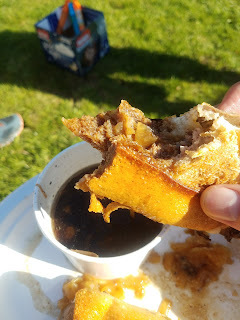 The bread was halved lengthwise, then quartered into sandwich-sized pieces. You can also see jarred pickled jalepenos in this picture. That was a benefit some would later enjoy. Another "feature", as it were (again, people need options). People started to show up and I was stressing a little bit. My parents and brother showed up early and helped some. The Ashbachs arrived, as did many other guests and I knew I had to initiate the cooking process. We only had a single grill which was to be used for toasting the buttered baguettes. Brian brought over a butane torch which I requested so we could melt the cheese. The meat was simply heated in a pan. 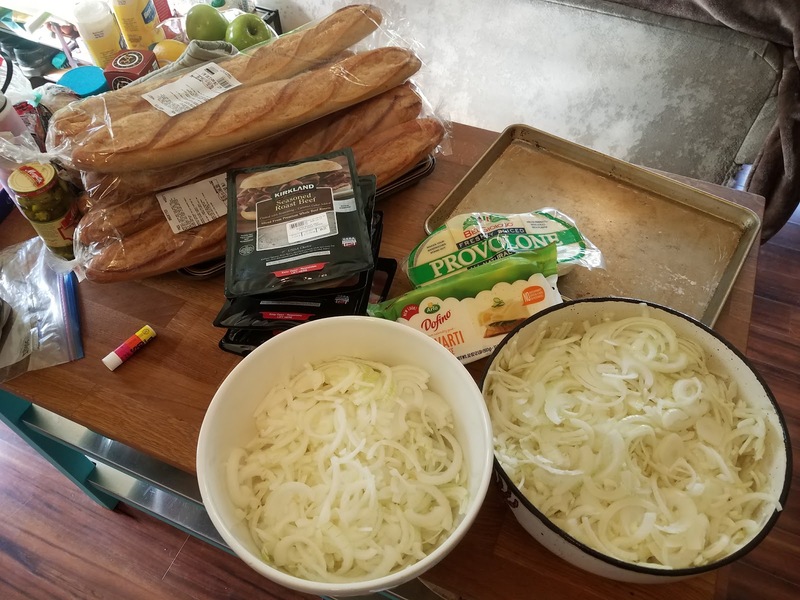 The onions were caramelized by Heather in a large pot on a propane stove. Chris Auty took on the project of roasting the garlic on the bbq and that worked out fine. Heather also lead the production of the au jus, which, once started received caramelized onions and roasted garlic for additional flavor. 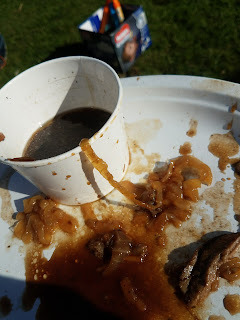 I and everyone else loved the jus (we used Johnny's packets as the base) but Heather thought it should have been stronger. 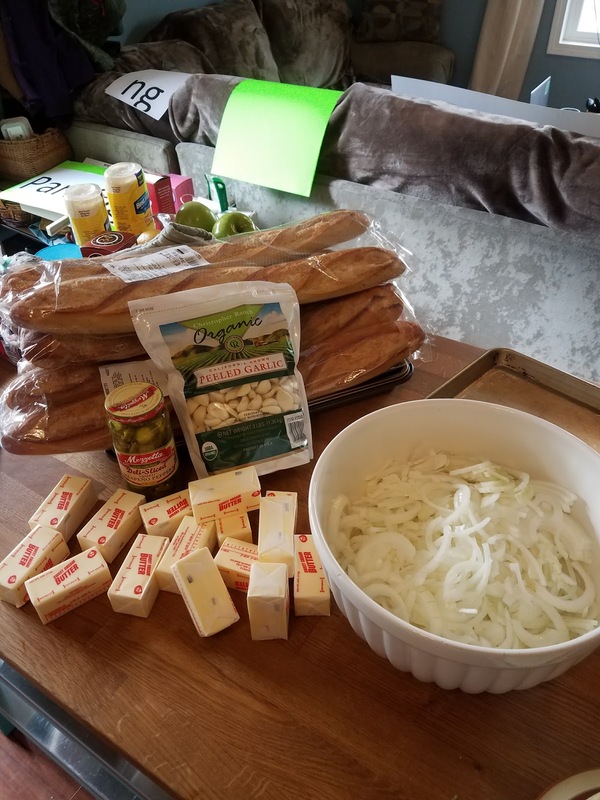 Once we had all of the basic supplies in order, we started serving the other guests. They would pick their buttered bread, which they would toast themselves on the grill. Then Brian would add the cheese of their choice (again, Provolone or Havarti) and hit it with the butane torch to make it nice and melted. 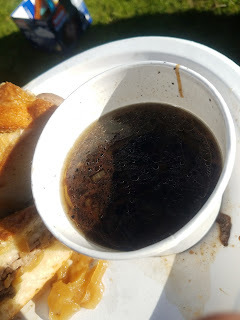 They would add the amount of meat that they wanted (roast beef or turkey, which was simply from Costco and heated on a pot on the BBQ) and would then receive their jus cup and jus from one of the Ashbachs or my parents. We had a big label and it was nice and chunky. Oh, and they would get caramelized onions on it if they wanted it. And they could choose other toppings and sides (and a lot of other food people brought). The sides included pickle chips and pickled jalepenos. I think this is Garth's sandwich. Looks good, right? My mom put pickles on hers which was not the intention but okay. We can see the caramelized onions and some chunks in the dark jus, which also has that nice oil sheen we like. Thanks, Heather, for your leadership on the cooking line! 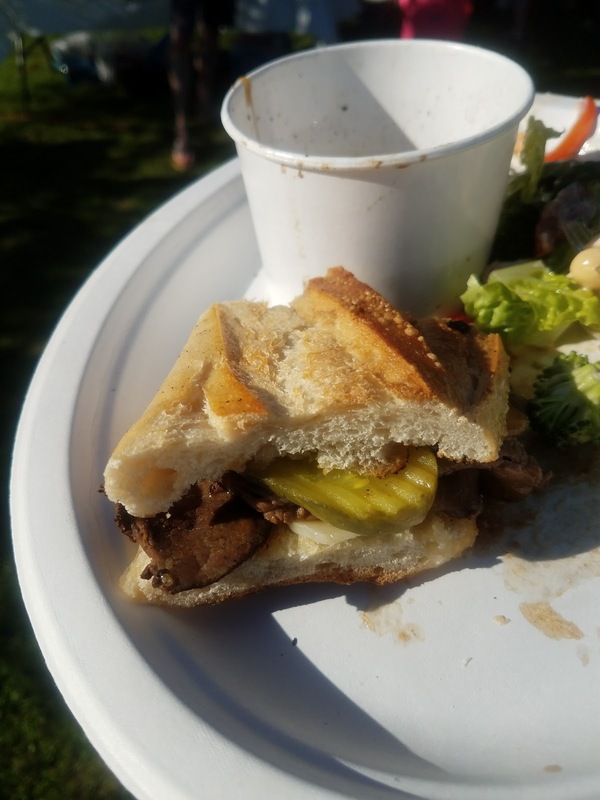 Another view of one of the 40 sandwiches with pickles on the side. We didn't have a grip of beef, and having a burger option would have been a nice touch. 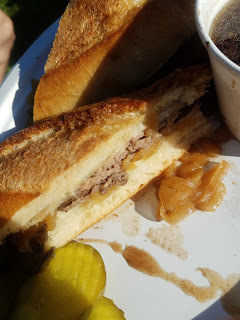 That's what the remnants of a delicious French dip sandwich should look like. 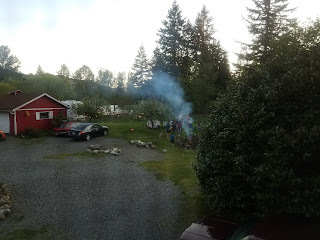 Kind of a picture of the party I think. And we had a bonfire later that was really hard to get started. Jus was a 5. Heather did a great job. I loved it. Chunks of caramelized onions and roasted garlic. Good grief, it doesn't get better than this but she thought it should have been saltier/richer. Bread 5. 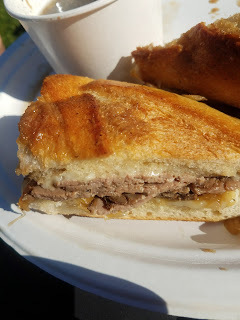 Great baguettes from costco, buttered, then grilled on a BBQ for a little smoky flavor. Meat 3. I'm going to score this low. The meat was fine and didn't ruin anything but I'll have to figure out a more impressive approach next time. Meat is expensive!!!!! Non Meat Toppings 5. The two cheese types, melted with the torch were awesome. And we also had plentiful delicious caramelized onions and roasted garlic as well as pickled jalepenos. I'd do it again. It was so fun and satisfying. I will always remember that and I think my guests will as well.